If you're looking for a fun way to while away a Sunday get yourself a four year old and a couple of tickets to see the How To Train Your Dragon "Live Spectacular"! It actually is spectacular. No, it really, really is. Minds were blown. It was supposed to be playing in Cleveland in a few weeks and I was so excited to take Wes on a special date to see it, just the two of us for a little one on one time. Then Friday I got an email letting me know the show was indefinitely postponed and a refund for the tickets. I was SO BUMMED. I called the arena to get details on a new date and they of course had no details or any information on rescheduling. I was afraid they might not reschedule or even if they did, what if it was a day we wouldn't be able to make it for some reason. So, I scrambled and bought last minute tickets for the next closest show - which happened to be this weekend in Pittsburgh. 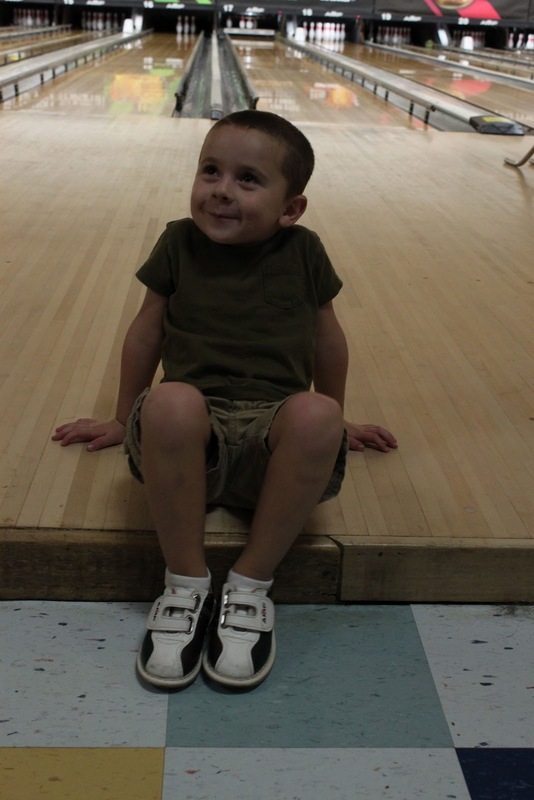 Wes did great on the two hour drive into PA and he was so excited to see the show, it was all he could talk about. We made our way to the venue, grabbed some (laughably overpriced) snacks and found our seats. That's when Wes started looking around at our surroundings with less a look of excitement and enthusiasm and more a look of get me the f outta here. I think he was a little taken aback by the size and scope of the set, not to mention the lights flashing and music playing. It hadn't even started yet and I could tell he was already getting super nervous. "Mom, I'm scared. The dragons are going to fly up here and get us." "No, they're not honey. Remember, they're not real, they're like dragon robots." "No, they're dragons, they don't eat candy and popcorn." That was the exact moment the lights dimmed and the show kicked off with fire explosions, plumes of smoke and, you guessed it, flying dragons. That's also when Wes burst into tears and started begging to go home. I can't really blame him. Those dragons were amazingly life-like and also amazingly ENORMOUS. I pulled him over onto my lap and held him tight and tried to explain it wasn't real, but man they looked REAL. It all turned out ok though, after a few minutes when he realized they weren't getting any closer to us, he relaxed. He managed to return to his own seat and by intermission he was pretending to fly around the corridors like a dragon. By the second act he was totally into it, cheering, waving and clapping his hands. This is what he looked like 5 minutes in to the car ride home and three bites in to his peanut butter and jelly sandwich. 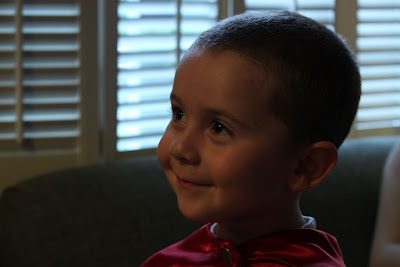 So after months of waiting, we finally recieved the greatly anticipated $40 dvd of Weston's spiderman recital. The videos of the two shows are funny, but not nearly as funny as watching them in person was. They shot the video from way in the back of the auditorium so you can't see as much of the boys' silly faces and expressions as we could see from our seats in the second row. Still, you can see them do a pretty good job in the first performance (that's Wes in the center, waving to us) and then it all quickly deteriorating in the second show where Wes just pretty much picked his nose and layed on the ground the whole time. Enjoy! Thanks, Ma for biting the bullet on this pricey little piece of footage. We are lucky to have it to embarass Wes with in the years to come! this is the last of the august birthday posts, i swear. 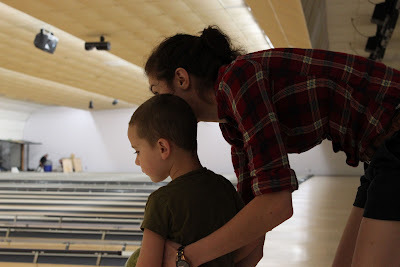 monday was wes's actual birthday and i was off work and home with the boys for the day so we planned a little mid-day bowling/pizza party for wes with just a few of our family members who happened to be off work in the middle of a monday. wes was pretty in to it and oren was pretty in to the pizza. wes chose all of our official bowling monikers. poor marisa got nothing, literally. 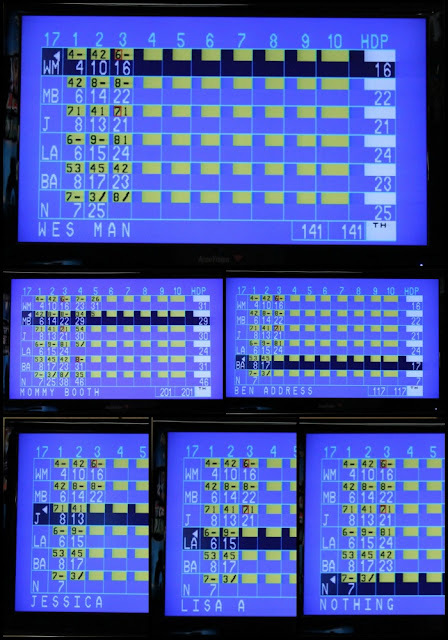 also, it should be noted that jessica and i bowled on par with wes the entire time. 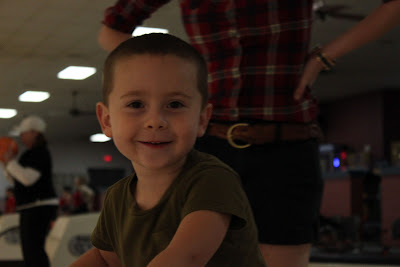 wes, who has never bowled before and is four. and we had bumpers. 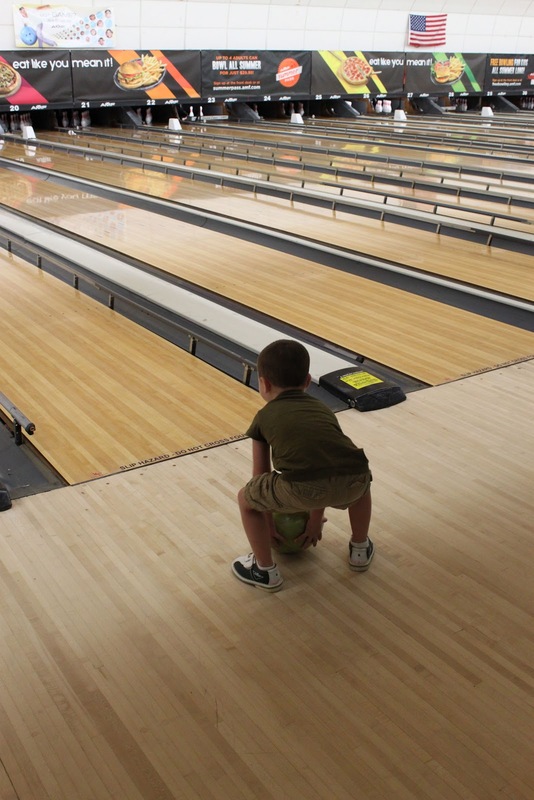 we are bad at bowling. lisa, on the other hand, managed to bowl a strike from this position. 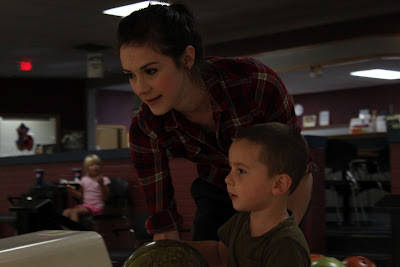 she is good at bowling. can i use oren as my excuse? he was in love! and so excited! oh gary, why'd you have to go and pinch the birthday boy the first time he tried to hold you? he hasn't held them since. it's going great! luckily, we had birthday pie to distract him. abby makes him his own little pie every year on his actual birthday. it's become the cutest tradition. a picture from last year here, and oren's birthday pie here. this is the first year he has deviated from blueberry pie, this year he requested strawberry. but mostly, i think he was just in it for the whipped cream. and yeah, this happens on other people's birthdays too. world - but i'm gonna say it anyway. we are so lucky and we love you all! I have to apologize for the birthday overload lately, but with Wes, me and my my mom all having our birthdays in the same week - it happens. 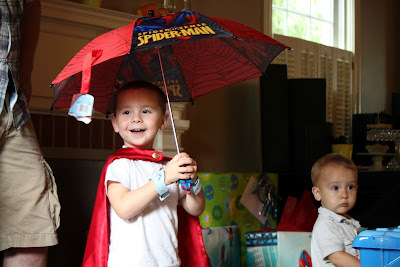 We had Wes's party over the weekend - superhero themed, of course. I made the cake and decorations and Abby made all of the amazingly delicious mini pies. I have to admit though, the best part of the party was when a special guest stopped by with a surprise visit for the birthday boy. I don't think he will ever forget this day. Thank you Adam! It went exactly as we had hoped it would! You're the best friend/spidey we could ask for. And thank you to Victor for capturing this on video. It's priceless!